Two rack widths available: 14" and 22"
Quickly mount and wire up your system components using the TesRac DIN rail test rack from QuepTech. Built from a lightweight aluminum channel frame, the TesRac is compact and sturdy -- perfect for a lab test bench or more permanent installations. DIN rails may be added, removed, or re-positioned nearly anywhere on the A-frame design. The base includes mounting holes to add a 120 VAC power strip and/or power distribution boards. The A-frame design increases usable space for a given bench area. With the 14" TesRac, you can mount more than 392 sq. in. of DIN rail equipment in 192 sq. in. of bench space. Plus, if you use the A-Frame ends, you pick up an additional 230.75 sq. in. That's 622.75 sq. in. of usable space in a 192 sq. in. area. When you need to do a 6-month burn-in, use TesRac. You'll save on lab space and keep your setup safe. If you just have a messy test setup, build your TesRac once and store it away until you need it again. TesRac provides a neat, solid platform on which to build your system and a compact means to store it for future use. 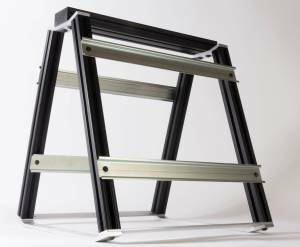 Like all other Winford products, these racks can ship with the $7.50 flat-rate shipping option. TS-QTTR14 Footprint: approx 13.375" x 14"
TS-QTTR22 Footprint: approx 13.375" x 22"